Today I followed NCR32 and NCR3, and then took a separate cross-country route over to Marazion. On the NCR3 stretch I took a brief diversion of a few miles to visit the Carnon Viaduct, which crosses a cycle route. The cross-country route later in the day took in plenty of as-yet unmapped roads. I’ve still got a large backlog of unentered data though — I’ve just started entering data from day 5. 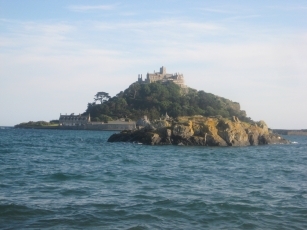 Tonight’s stay is in Marazion, famous for being opposite St. Michael’s Mount, which you may recognise from being featured in one of the BBC1 idents a while back. This entry was posted on Thursday, June 25th, 2009 at 17:09 and is filed under Cycling. You can follow any responses to this entry through the RSS 2.0 feed. You can leave a response, or trackback from your own site. On mapping back logs: to be honest I’m more often than not 1-2 weeks behind on entering the data, sometimes a whole month. But that’s because of work (and needing breaks from the computer I work on).